Notes: This nymph, a variation of the Prince Nymph, was created by Mt. Shasta guide, Ron Hart in 1986. It became quite popular within the Northern Sierras during the mid 1990's and the popularity of this nymph seems to be growing as yet. The Dark Lord tries to imitate the natural nymphs by utilizing darker colors yet still retains the contrast of the wings to the body - the same character that makes the Prince Nymph quite effective as an attractor nymph. The wings are a Ginger color which imitates the naturals and contrasts well against the black body. The gold wire ribbing offers a segmented appearance. The Black Hen Hackle fibers are tied in small bundles downward on each side of the thorax to give the appearance of legs. 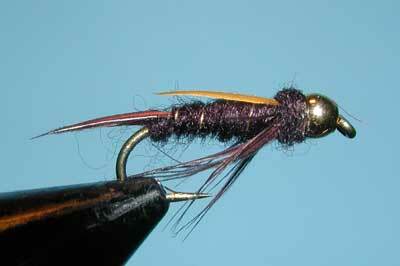 Ron Hart's original pattern uses stiffer neck hackle fibers extending to the base of the tail for the legs. Some variations on this pattern will apply the legs by wrapping a neck hackle twice, trimming off the upper fibers.